It is told that Rachel Felix was born on March 24, 1821, at Munf, near the town of Aarau, in the Canton of Aargau, Switzerland; the burgomaster of the district simply noting in his books that upon the day stated, at the little village inn, the wife of a poor pedler had given birth to a female child. The entry included no mention of family, name, or religion, and otherwise the event was not registered in any civil or religious record. The father and mother were Abraham Felix, a Jew, born in Metz, but of German origin, and Esther Haya, his wife. They had wandered about the continent during many years, seeking a living and scarcely finding it. Several children were born to them by the wayside, as it were, on their journeyings hither and thither: Sarah in Germany, Rebecca in Lyons, Dinah in Paris, Rachel in Switzerland; and there were other infants who did not long survive their birth, succumbing to the austerities of the state of life to which they had been called. For a time, perhaps because of their numerous progeny, M. and Madame Felix settled in Lyons. Madame Felix opened a small shop and dealt in second-hand clothes; M. Felix gave lessons in German to the very few pupils he could obtain. About 1830 the family moved to Paris. They were still miserably poor. The children Sarah and Rachel, usually carrying a smaller child in their arms or wheeling it with them in a wooden cart, were sent into the streets to earn money by singing at the doors of cafes and estaminets. A musical amateur, one M. Morin, noticed the girls, questioned them, interested himself about them, and finally obtained their admission into the Government School of Sacred Music in the Rue Vaugirard. Rachel's voice did not promise much, however; as she confessed, she could not sing--she could only recite. She had received but the scantiest and meanest education; she read with difficulty; she was teaching herself writing by copying the manuscript of others. Presently she was studying elocution under M. St. Aulaire, an old actor retired from the Francais, who took pains with the child, instructing her gratuitously and calling her "ma petite diablesse." The performances of M. St. Aulaire's pupil were occasionally witnessed by the established players, among them Monval of the Gymnase and Samson of the Comedie. Monval approved and encouraged the young actress, and upon the recommendation of Samson she entered the classes of the Conservatoire, over which he presided, with Michelot and Provost as his co-professors. At the Conservatoire Rachel made little progress. All her efforts failed to win the good opinion of her preceptors. In despair she resolved to abandon altogether the institution, its classes and performances. She felt herself neglected, aggrieved, insulted. "Tartuffe" had been announced for representation by the pupils; she had been assigned the mute part of Flipote, the serving-maid, who simply appears upon the scene in the first act that her ears may be soundly boxed by Madame Pernelle. To this humiliation she would not submit. She hurried to her old friend, St. Aulaire, who consulted Monval, who commended her to his manager, M. Poirson. She entered into an engagement to serve the Gymnase for a term of three years upon a salary of 3,000 francs. M. Poirson was quick to perceive that she was not as so many other beginners were; that there was something new and startling about the young actress. He obtained for her first appearance, from M. Paul Duport, a little melodrama in two acts. It was called "La Vendeenne," and owed its more striking scenes to "The Heart of Midlothian." After the manner of Jeanie Deans, Genevieve, the heroine of the play, footsore and travel-stained, seeks the presence of the Empress Josephine to implore the pardon of a Vendean peasant condemned to death for following George Cadoudal. "La Vendeenne," produced on April 24, 1837, and received with great applause, was played on sixty successive nights, but not to very crowded audiences. The press scarcely noticed the new actress. The critic of the Journal des Debats, however, while rashly affirming that Rachel was not a phenomenon and would never be extolled as a wonder, carefully noted certain of the merits and characteristics of her performance. "She was an unskilled child, but she possessed heart, soul, intellect. There was something bold, abrupt, uncouth about her aspect, gait, and manner. She was dressed simply and truthfully in the coarse woollen gown of a peasant-girl; her hands were red; her voice was harsh and untrained, but powerful; she acted without effort or exaggeration; she did not scream or gesticulate unduly; she seemed to perceive intuitively the feeling she was required to express, and could interest the audience greatly, moving them to tears. She was not pretty, but she pleased," etc. Bouffe, who witnessed this representation, observed: "What an odd little girl! Assuredly there is something in her. But her place is not here." So judged Samson also, becoming more and more aware of the merits of his former pupil. She was transferred to the Francais to play the leading characters in tragedy, at a salary of 4,000 francs a year. M. Poirson did not hesitate to cancel her agreement with him. Indeed, he had been troubled with thinking how he could employ his new actress. She was not an ingenue of the ordinary type; she could not be classed among soubrettes. There were no parts suited to her in the light comedies of Scribe and his compeers, which constituted the chief repertory of the Gymnase. Rachel as the Muse of Greek Tragedy. It was on June 12, 1838, that Rachel, as Camille, in "Horace," made her first appearance upon the stage of the Theatre Francais. The receipts were but seven hundred and fifty francs; it was an unfashionable period of the year; Paris was out of town; the weather was most sultry. There were many Jews in the house, it was said, resolute to support the daughter of Israel, and her success was unequivocal; nevertheless, a large share of the applause of the night was confessedly carried off by the veteran Joanny, who played Horace. On June 16th Rachel made her second appearance, personating Emilie in the "Cinna," of Corneille. The receipts fell to five hundred and fifty francs. She repeated her performance of Camille on the 23d; the receipts were only three hundred francs! the poorest house, perhaps, she ever played to in Paris. She afterward appeared as Hermione in "Andromaque," Amenaide in "Tancrede," Eriphile in "Iphigenie," Monime in "Mithridate," and Roxane in "Bajazet," the receipts now gradually rising, until, in October, when she played Hermione for the tenth time, six thousand francs were taken at the doors, an equal amount being received in November, when, for the sixth time, she appeared as Camille. Paris was now at her feet. In 1839, called upon to play two or three times per week, she essayed but one new part, Esther, in Racine's tragedy of that name. The public was quite content that she should assume again and again the characters in which she had already triumphed. In 1840 she added to her list of impersonations Laodie and Pauline in Corneille's "Nicomede" and "Polyeucte," and Marie Stuart in Lebrun's tragedy. In 1841 she played no new parts. 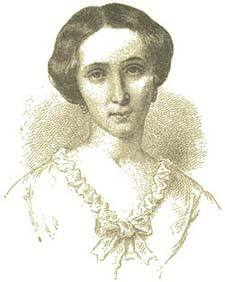 In 1842 she first appeared as Chimene in "Le Cid," as Ariane, and as Fredegonde in a wretched tragedy by Le Mercier. Rachel had saved the Theatre Francais, had given back to the stage the masterpieces of the French classical drama. It was very well for Thackeray to write from Paris in 1839 that the actress had "only galvanized the corpse, not revivified.... Racine will never come to life again and cause audiences to weep as of yore." He predicted: "Ancient French tragedy, red-heeled, patched, and beperiwigged, lies in the grave, and it is only the ghost of it that the fair Jewess has raised." But it was something more than a galvanized animation that Rachel had imparted to the old drama of France. During her career of twenty years, her performances of Racine and Corneille filled the coffers of the Francais, and it may be traced to her influence and example that the classic plays still keep their place upon the stage and stir the ambition of the players. But now the committee of the Francais had to reckon with their leading actress, and pay the price of the prosperity she had brought them. They cancelled her engagement and offered her terms such as seemed to them liberal beyond all precedent. But the more they offered, so much the more was demanded. In the first instance, the actress being a minor, negotiations were carried on with her father, the committee denouncing in the bitterest terms the avarice and rapacity of M. Felix. But when Rachel became competent to deal on her own behalf, she proved herself every whit as exacting as her sire. She became a societaire in 1843, entitled to one of the twenty-four shares into which the profits of the institution were divided. She was rewarded, moreover, with a salary of forty-two thousand francs per annum; and it was estimated that by her performances during her conge of three or four months every year she earned a further annual income of thirty thousand francs. She met with extraordinary success upon her provincial tours; enormous profits resulted from her repeated visits to Holland and Belgium, Germany, Russia, and England. But, from first to last, Rachel's connection with the Francais was an incessant quarrel. She was capricious, ungrateful, unscrupulous, extortionate. She struggled to evade her duties, to do as little as she possibly could in return for the large sums she received from the committee. She pretended to be too ill to play in Paris, the while she was always well enough to hurry away and obtain great rewards by her performances in the provinces. She wore herself out by her endless wanderings hither and thither, her continuous efforts upon the scene. She denied herself all rest, or slept in a travelling carriage to save time in her passage from one country theatre to another. Her company complained that they fell asleep as they acted, her engagements denying them proper opportunities of repose. The newspapers at one time set forth the acrimonious letters she had interchanged with the committee of the Francais. Finally she tended her resignation of the position she occupied as societaire; the committee took legal proceedings to compel her to return to her duties; some concessions were made on either side, however, and a reconciliation was patched up. The new tragedies, "Judith" and "Cleopatre," written for the actress by Madame de Girardin, failed to please, nor did success attend the production of M. Romand's "Catherine II.," M. Soumet's "Jeanne d'Arc," in which, to the indignation of the critics, the heroine was seen at last surrounded by real flames! or "Le Vieux de la Montagne" of M. Latour de St. Ybars. With better fortune Rachel appeared in the same author's "Virginie," and in the "Lucrece" of Ponsard. Voltaire's "Oreste" was revived for her in 1845 that she might play Electre. She personated Racine's "Athalie" in 1847, assuming long white locks, painting furrows on her face, and disguising herself beyond recognition, in her determination to seem completely the character she had undertaken. In 1848 she played Agrippine in the "Britannicus" of Racine, and dressed in plain white muslin, and clasping the tri-colored flag to her heart, she delivered the "Marseillaise" to please the Revolutionists, lending the air strange meaning and passion by the intensity of her manner, as she half chanted, half recited the words, her voice now shrill and harsh, now deep, hollow, and reverberating--her enraptured auditors likening it in effect to distant thunder. To the dramatists who sought to supply her with new parts, Rachel was the occasion of much chagrin and perplexity. After accepting Scribe's "Adrienne Lecouvreur" she rejected it absolutely only to resume it eagerly, however, when she learned that the leading character was to be undertaken by Mademoiselle Rose Cheri. His "Chandelier" having met with success, Rachel applied to De Musset for a play. She was offered, it seems, "Les Caprices de Marianne," but meantime the poet's "Bettine" failed, and the actress distrustfully turned away from him. An undertaking to appear in the "Medea" of Legouve landed her in a protracted lawsuit. 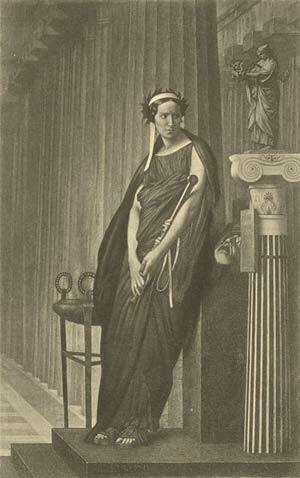 The courts condemned her in damages to the amount of two hundred francs for every day she delayed playing the part of Medea after the date fixed upon by the management for the commencement of the rehearsals of the tragedy. She paid nothing, however, for the management failed to fix any such date. M. Legouve was only avenged in the success his play obtained, in a translated form, at the hands of Madame Ristori. In lieu of "Medea" Rachel produced "Rosemonde," a tragedy by M. Latour de St. Ybars, which failed completely. Other plays written for her were the "Valeria" of MM. Lacroix and Maquet, in which she personated two characters--the Empress Messalina and her half sister, Lysisca, a courtesan; the "Diane," of M. Augier, an imitation of Victor Hugo's "Marion Delorme;" "Lady Tartuffe," a comedy by Madame de Girardin; and "La Czarine," by M. Scribe. She appeared also in certain of the characters originally contrived for Mademoiselle Mais, such as La Tisbe in Victor Hugo's "Angelo," and the heroines of Dumas's "Mademoiselle de Belle Isle" and of "Louise de Lignerolles" by MM. Legouve and Dinaux. The classical drama of France has not found much favor in England and America. We are all, perhaps, apt to think with Thackeray disrespectfully of the "old tragedies--well-nigh dead, and full time too--in which half a dozen characters appear and shout sonorous Alexandrines for half a dozen hours;" or we are disposed to agree with Mr. Matthew Arnold, that their drama, being fundamentally insufficient both in substance and in form, the French, with all their gifts, have not, as we have, an adequate form for poetry of the highest class. Those who remember Rachel, however, can testify that she breathed the most ardent life into the frigid remains of Racine and Corneille, relumed them with Promethean heat, and showed them to be instinct with the truest and intensest passion--When she occupied the scene, there could be no thought of the old artificial times of hair powder and rouge, periwigs and patches, in connection with the characters she represented. Phedre and Hermione, Pauline and Camille, interpreted by her genius, became as real and natural, warm and palpitating, as Constance or Lady Macbeth could have been when played by Mrs. Siddons, or as Juliet when impersonated by Miss O'Neill. Before Rachel came, it had been thought that the new romantic drama of MM. Hugo and Dumas, because of its greater truth to nature, had given the coup de grace to the old classic plays; but the public, at her bidding, turned gladly from the spasms and the rant of "Angelo" and "Angele," "Antony" and "Hernani," to the old-world stories, the formal tragedies of the seventeenth century poet-dramatists of France. The actress fairly witched her public. There was something of magic in her very presence upon the scene. None could fail to be impressed by the aspect of the slight, pallid woman who seemed to gain height by reason of her slenderness, who moved toward her audience with such simple natural majesty, who wore and conducted her fluent classical draperies with such admirable and perfect grace. It was as though she had lived always so attired in tunic, peplum, and pallium--had known no other dress--not that she was of modern times playing at antiquity, she was the muse of Greek tragedy in person. The physical traditions of her race found expression or incarnation in her. Her face was of refined Judaical character--the thin nose slightly curved, the lower lip a trifle full, but the mouth exquisitely shaped, and the teeth small, white, and even. The profuse black-brown hair was smoothed and braided from the broad, low, white, somewhat over-hanging brow, beneath which in shadow the keen black eyes flashed out their lightnings, or glowed luridly like coals at a red heat. Her gestures were remarkable for their dignity and appropriateness; the long, slight arms lent themselves surprisingly to gracefulness; the beautifully formed hands, with the thin tapering fingers and the pink filbert nails, seemed always tremblingly on the alert to add significance or accent to her speeches. But there was eloquence in her very silence and complete repose. She could relate a whole history by her changes of facial expression. She possessed special powers of self-control; she was under subjection to both art and nature when she seemed to abandon herself the most absolutely to the whirlwind of her passion. There were no undue excesses of posture, movement, or tone. Her attitudes, it was once said, were those of "a Pythoness cast in bronze." Her voice thrilled and awed at its first note: it was so strangely deep, so solemnly melodious, until, stirred by passion as it were, it became thick and husky in certain of its tones; but it was always audible, articulate, and telling, whether sunk to a whisper or raised clamorously. Her declamation was superb, if, as critics reported, there had been decline in this matter during those later years of her life, to which my own acquaintance with Rachel's acting is confined. I saw her first at the Francais in 1849, and I was present at her last performance at the St. James' Theatre in 1853, having in the interval witnessed her assumption of certain of her most admired characters. And it may be true, too, that, like Kean, she was more and more disposed, as the years passed, to make "points," to slur over the less important scenes, and reserve herself for a grand outburst or a vehement climax, sacrificing thus many of the subtler graces, refinements, and graduations of elocution, for which she had once been famous. To English ears, it was hardly an offence that she broke up the sing-song of the rhymed tirades of the old plays and gave them a more natural sound, regardless of the traditional methods of speech of Clairon, Le Kain, and others of the great French players of the past. Less success than had been looked for attended Rachel's invasion of the repertory of Mlle. Mars, an actress so idolized by the Parisians that her sixty years and great portliness of form were not thought hindrances to her personation of the youthful heroines of modern comedy and drama. But Rachel's fittest occupation and her greatest triumphs were found in the classical poetic plays. She, perhaps, intellectualized too much the creations of Hugo, Dumas, and Scribe; gave them excess of majesty. Her histrionic style was too exalted an ideal for the conventional characters of the drama of her own time; it was even said of her that she could not speak its prose properly or tolerably. She disliked the hair-powder necessary to Adrienne Lecouvreur and Gabrielle de Belle Isle, although her beauty, for all its severity, did not lose picturesqueness in the costumes of the time of Louis XV. As Gabrielle she was more girlish and gentle, pathetic, and tender, than was her wont, while the signal fervor of her speech addressed to Richelieu, beginning, "Vous mentez, Monsieur le Duc," stirred the audience to the most excited applause. Rachel was seen upon the stage for the last time at Charleston on December 17, 1856. She played Adrienne Lecouvreur. She had been tempted to America by the prospect of extravagant profits. It had been dinned into her ears that Jenny Lind, by thirty-eight performances in America, had realized seventeen hundred thousand francs. Why might not she, Rachel, receive as much? And then, she was eager to quit Paris. There had been strange worship there of Madame Ristori, even in the rejected part of Medea. But already Rachel's health was in a deplorable state. Her constitution, never very strong, had suffered severely from the cruel fatigues, the incessant exertions, she had undergone. It may be, too, that the deprivations and sufferings of her childhood now made themselves felt as over-due claims that could be no longer denied or deferred. She forced herself to play, in fulfilment of her engagement, but she was languid, weak, emaciated; she coughed incessantly, her strength was gone; she was dying slowly but certainly of phthisis. And she appeared before an audience that applauded her, it is true, but cared nothing for Racine and Corneille, knew little of the French language, and were urgent that she should sing the "Marseillaise" as she had sung it in 1848! It was forgotten, or it was not known in America, that the actress had long since renounced revolutionary sentiments to espouse the cause of the Second Empire. She performed all her more important characters, however, at New York, Philadelphia, and Boston. Nor was the undertaking commercially disappointing, if it did not wholly satisfy expectation. She returned to France possessed of nearly three hundred thousand francs as her share of the profits of her forty-two performances in the United States; but she returned to die. The winter of 1856 she passed at Cairo. She returned to France in the spring of 1857, but her physicians forbade her to remain long in Paris. In September she moved again to the South, finding her last retreat in the villa Sardou, at Cannet, a little village in the environs of Cannes. She lingered to January 3, 1858. The Theatre Francais closed its doors when news arrived of her death, and again on the day of her funeral. The body was embalmed and brought to Paris for interment in the cemetery of Pere la Chaise, the obsequies being performed in accordance with the Jewish rites. The most eminent of the authors and actors of France were present, and funeral orations were delivered by MM. Jules Janin, Bataille, and Auguste Maquet. Victor Hugo was in exile; or, as Janin announced, the author of "Angelo" would not have withheld the tribute of his eulogy upon the sad occasion.